The first day at school can be a scary moment, but this easy keepsake project can turn it in a sweet memory. Your future self (and the grandparents!) will thank you for the time you spend now capturing your child’s first day at school. In the years to come, you’ll look back fondly – forgetting all those worries that are plaguing you before the big day: will your little one enjoy it? Will they make friends? Will they like their teacher? Will they be able to last the whole day? Will they cope? As well as giving you something to take your mind off your worries, creating a keepsake scrapbook full of pictures, photos and recollections about your child’s first day at school is a great way to capture the moment for posterity . What should go into your keepsake scrapbook? The ubiquitous hand dipped in paint and pressed onto a sheet of paper can be the first addition to your scrapbook – it has major cuteness factor when you look back and realise just how tiny they were! Whether your child is in uniform or their own clothes, capturing the moment they leave the house, bag in hand, is best done with your camera. Print off the best snaps and add them to your scrapbook. Make sure you capture the end of the school day photo too! It’s great to add in some thoughts from your child about how they are feeling and what they are expecting. It’s also nice to include some details about the things they love to add a flavour of what’s going on in their lives at the time. This way, you can remember together later – and you can explain why you sent him to school in a Peppa Pig t-shirt! Somewhatsimple.com offers free printables designed to capture these little details. Print them off, fill them in with your child, and include a copy in your scrapbook. There’s nothing better than including some of your child’s art work. If they don’t bring any home with them on their first day, ask them to draw something when they get home. 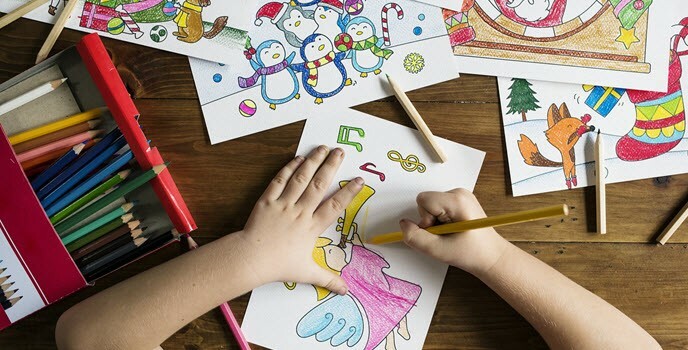 Relaxing after school with some sheets of blank paper and some coloured crayons is a great way to give your child time to unwind after her busy first day. Then collect in her drawings and add them to your scrapbook. As your child progresses through school, you can add a new selection of notes, artwork, reflections and paperwork each year – creating a really lovely record of their school career and a wonderful memento for you to share. For inspiration, take a look at these wonderful scrapbooking ideas from Martha Stewart. Why do we love World Origami Day?